The founder and leader of Fear God Fellowship International, a church based in Accra, Prophet Prince Baidoo has attributed the suffering of the people of Ghana since independence to the involvement of Ghana's first President, Dr. Kwame Nkrumah and his successors in idol worship. The prophet said this to reporters at a news conference in Tema last Friday, organized by the Ghana branch of the International Network of Churches, Ministries and Businesses (INCMB) to announce a business conference that would take off in Accra this week. The conference would assemble businessmen and women and pastors from the United States, the United Kingdom and some African countries to discuss ways improving the economy and the strategic investment opportunities in the country. He said these photographs were sold in 1966 when Nkrumah was overthrown. According to him, Nkrumah kept this god at the Flagstaff house and at the castle. “Some of the human blood was also sent to the Independence Square. 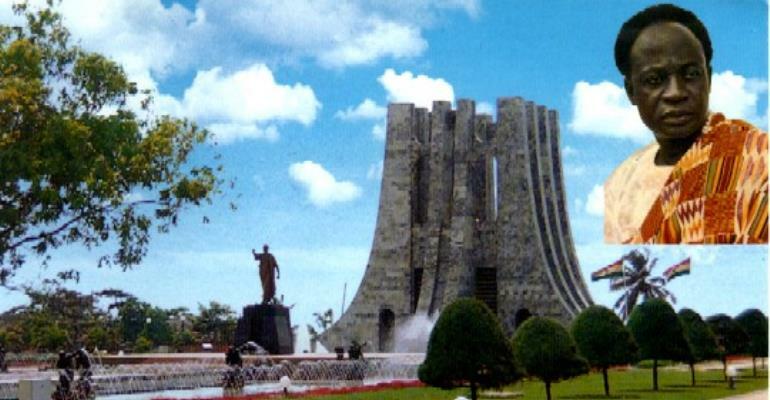 The statue at the Independence Square was built with human blood” he reiterated. On the immediate former president, Prophet Baidoo said Dr. Nkrumah's Kankan Nyame and former President Rawlings' slogan Gye Nyame had no significant difference. He described the star in a hand with the inscription Gye Nyame on the country's bank notes as juju and could be attributed to the fallen value of the cedi. The Man of God further said bloodshed would continue as it happened at the stadium disaster if Ghanaians continued to accept blood as stated in the national song, Yen ara asase ni. “Some of the juju medicine was also kept in the Peduase Lodge and at the Osu cemetery. When invited, I will be able to show and prove where it was buried at Osu cemetery,” he added. He said everyone aspiring to be President could have good plans and policies for the nation but when that person is elected or becomes President and enters the castle, all the good policies or plans would be fizzle into nothing. To solve these problems, the Prophet pleaded President J.A. Kufuor's administration to pave way for prophets from different religious bodies to deliver the nation through fasting and prayers. He told The Chronicle that he had over 70 spiritual revelations for the nation, but would reveal them after he had been invited. Dr Nkrumah, he said, did all these because he wanted power to rule Ghana and Africa that is, being the Messiah of Africa. Talking about the investment conference, the public relations officer of the INCB, Mr. Fletcher, said the network was bringing in businesspersons with the fear of God to invest in the country. “It is time for churches to also give to their congregation. It should not always be one - sided.” He said the conference would not be a mere talk shop but one that would see the implementation of the outcome of the discussion. He disclosed that the network was prepared to invest in the aviation and the telecommunication industries as well as other viable ventures in the country. Mr. Fletcher said the INCMB had the mission of facilitating meaningful relationship, equipping and enabling ministers by sharpening their ministerial skills, evaluation of current trends among others.